The Social follow module helps you increase the number of your followers on social networks, and reach your followers faster. 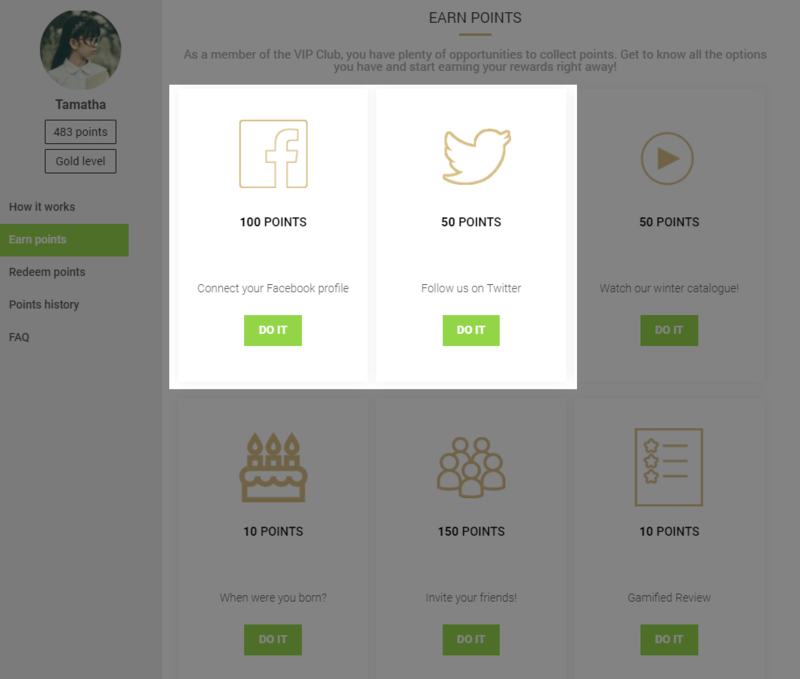 Currently you can provide an incentive for members to follow your brand on Twitter or connect their Facebook profile with the loyalty program, and we are planning to add more rewardable social network activities in the future. When enabling a Twitter follow or Facebook connect activity, a new card will appear in the Loyalty Hub. You can find the configuration page of Social follow module by clicking on the ‘Modules’ link in the top menu bar, then selecting the ‘Gamification modules’ from the list on the left-hand side. Basic account information will be synced with the customer’s profile when they connect their accounts. When enabling a Twitter follow or Facebook connect activity, a new card will appear in the Loyalty Hub. The design and content of both the front and back side can be customized with custom CSS and HTML using Antavo’s Design editor. Please, consult your Onboarding manager when designing the card.